Experts are advising anyone with the highly-contagious norovirus to avoid handling food for 48 hours, so it has less chance of spreading to others. Emergence of the vomiting bug - often referred to as "winter vomiting bug" as it's known to soar during the colder months - has prompted Public Health England (PHE) to issue guidance to prevent a widespread outbreak. 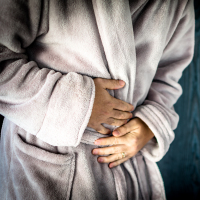 "Those who have diarrhoea and vomiting should not prepare food until 48 hours after symptoms have disappeared," says Nick Phin, national infection service deputy director at PHE. The health body's guidance comes as a timely reminder for holidaymakers of the importance of having medical travel insurance. Diarrhoea, vomiting and nausea are all symptoms of norovirus. The NHS reports that some sufferers may also experience a slight fever, stomach cramps, aching limbs and headaches. Mr Phin says the "unpleasant" bug is highly contagious, but symptoms only last for a couple of days. "Most people get over it within a day or two but in the very young, elderly or those who have weakened immune systems it can last longer and it is easy to get dehydrated, so it is important to drink plenty of fluids to prevent this," Mr Phin continued. The virus can be passed to others through skin-on-skin contact, such as shaking hands. However, it can also be picked up off worktops, door handles and taps, and PHE calls on anyone with the virus to fully disinfect surfaces to prevent its spread. "We advise that they should avoid visiting GP surgeries, care homes and hospitals if they have symptoms. If anyone has symptoms and is concerned they should contact NHS 111 or talk to their GP by phone," added Mr Phin.